- Talk to Wakka and Lulu to learn a few things about the trip in general. Note that Yuna's a bit clogged with people at the moment. - Approach the rear of the ship. It's a bit difficult to see, but near the door leading to the navigation cabin is a set of stairs. Go down. - The first person you'll meet down here is O'aka, merchant extraordinaire. Though he is a bit of a jerk, it's not a terrible idea to give money to O'aka. He'll follow you throughout your journey, later providing items, and if you donate now the prices he charges will decrease. O'aka's often the only guy around to sell you things while in dangerous territory. - Check the white door on the right side of the lower deck. Inside you'll find a chest containing a Remedy. Also here is a suitcase; kick it seven times to receive as many Potions. - Behind O'aka is the Power Room. After receiving a lesson about chocobo power, check the floor near the bottom-right corner of your screen for the Al Bhed Primer Vol. III. 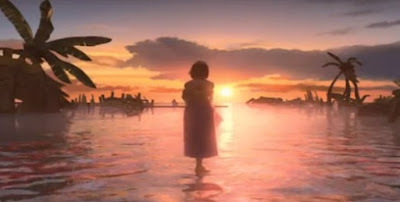 - Approach Yuna's crowd after looking around, then talk to Wakka. This will clear up Yuna for a conversation. You know what to do. Just be ready for battle, 'cause a battle is ready for you! Though technically a boss, Sin isn't that tough. The fin itself does nothing, relying on the three Sinscales it deploys to attack your party. Wipe out two of the Sinscales, then use Wakka, Yuna / Valefor and Lulu's long-range attacks to hit Sin. Don't kill all three Sinscales or Sin will deploy a fresh complement, over and over and over. - After 'defeating' Sin, Wakka and Tidus will have to fight a solo battle. Only two characters? Eesh. Fortunately, this battle isn't so bad. Ignore the Sinscales completely and focus your attacks on the Sinspawn. Use Wakka's Dark Attack to inflict blindness on Echuilles, thereby greatly reducing its ability to drain HP. After that, just wail away until it crumbles, reapplying blindness as needed. So long as you keep your HP in the 200s as a minimum, the Sinspawn and its cohorts won't be able to kill either of your characters. - Welcome to, er, pictuesque Kilika. Sin hasn't left much to see in its wake; make do with what you find. Start by using the Save Sphere beside the S.S. Liki. - Follow the gangplanks northwest. On the next screen you'll see Yuna doing what summoners do. - Zip to the Inn. After a nice night's sleep, leave. - Return to the Inn and wander west. On the left side of the walkway is a ramshackle house with a child in it. Approach it from the proper angle and Tidus will save her before it can collapse. The other hut on this screen contains a chest; inside it are three Potions. Grab them, return to the walkway, and carry on northward. - After a short cut scene you'll wind up at a crossroads, with paths leading north, east, and west. Dead ahead is a fiend blocking the path; it's an optional fight which we'll return to shortly. - To the east is a dead end with a chest. Inside the chest are two Mana Spheres. - To the west is another split in the path. Both lead to the same spot, though heading north takes less time - and you'll find a Scout in a chest along the way. - Either way, you'll arrive at another crossroads, this one watched over by some Crusaders. Follow the Crusaders who head north to arrive past the huge fiend guarding the main path. - Speak to the female crusader here to receive a Hi-Potion. - Go north. You'll quickly arrive at a dead end. Inside a chest here is a Luck Sphere. - Return to the female crusader. You now have an option: you can either run east and north to find the way out of this area... or you can take on that fiend you bypassed earlier. - Sleep, which inflicts regen status on Lord Ochu. If you hit Lord Ochu out of sleep it will immediately counter with the all-hitting Earthquake. Be prepped for that. Your primary weapon here will be Lulu's Fire spell. Keep her in the front lines and use her to fry Lord Ochu every time her turn comes up. Wakka's Silence Attack will stop Water from popping up; beyond that, everyone else should just be hitting and defending. Yuna is invaluable here if she's learned Esuna to counter Poison Claw. Lord Ochu will take a while to beat down, but it's not that difficult. After beating the Lord Ochu, speak to Luzzu and Gatta. Luzzu will give you an Elixir. Then you can head north and continue to your next destination, Kilika's Cloister of Trials.